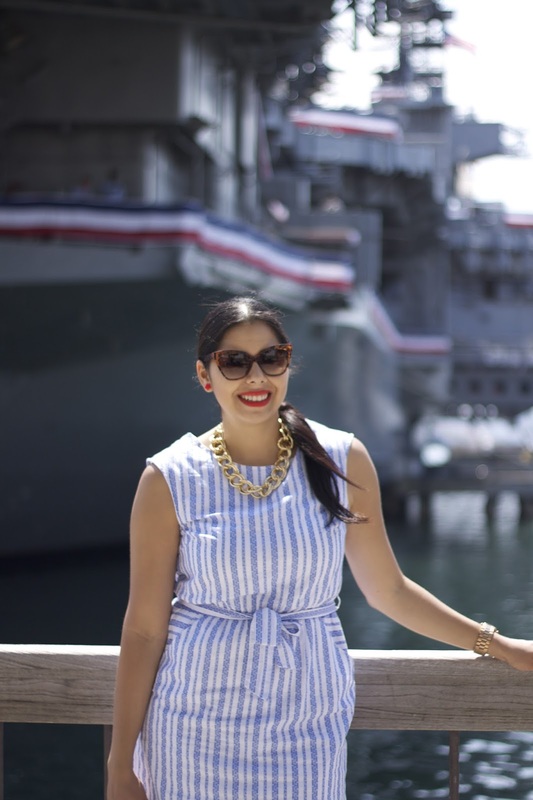 It's fourth of July week and it's time to indulge in the Red White and Blue fashion! 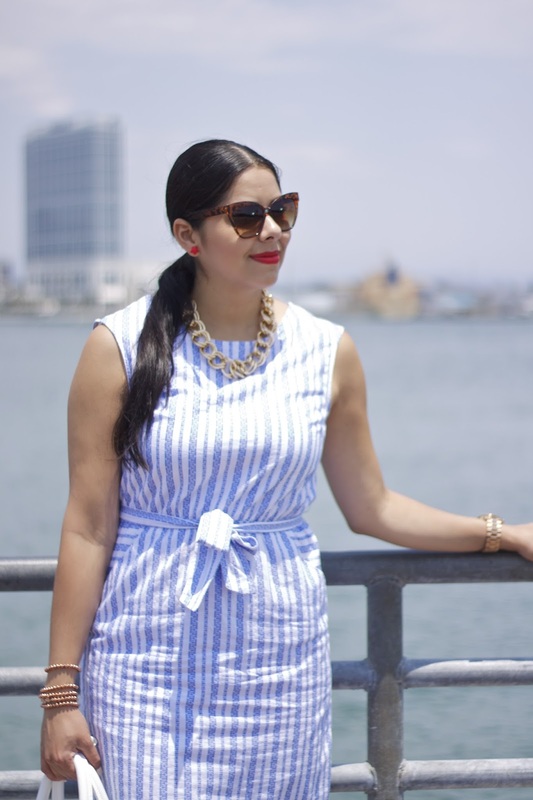 I added a red lip to my blue and white outfit which is a simple way to turn your outfit from sailor to patriotic! It was another beautiful sunny weekend in San Diego and to enjoy it, the family and I started off with brunch at Candela's on the Bay in Coronado Island. After sippin' on mimosas and munchin' on the Mexican breakfast buffet (accompanied by a wonderful view of the bay), we decided to hop on the ferry into downtown. 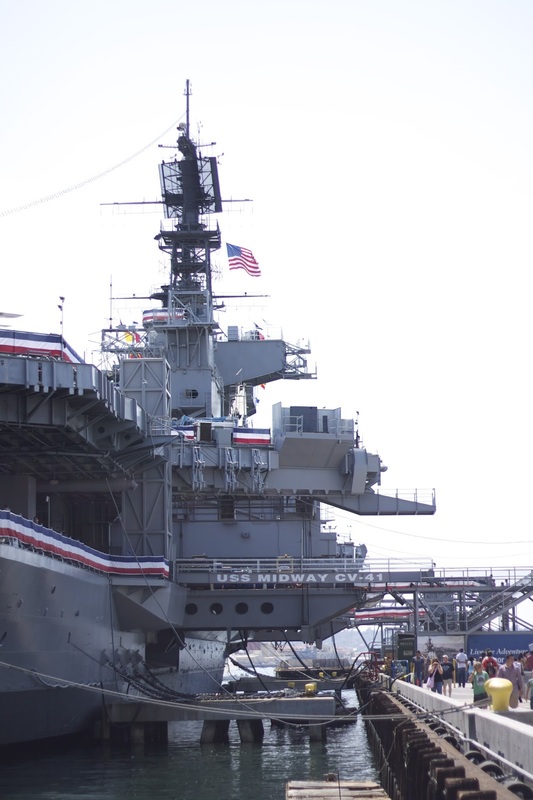 The ferry dropped us off by the USS Midway Aircraft Carrier Museum which is a great sight to see if you are in San Diego, and next to the "Unconditional Surrender" Statue which made me feel extra patriotic! About my Outfit: Target Dress, Handbag: Deal: Just Fab or Splurge: 3.1 Phillip Lim, Shoe Dazzle "GALLY" Wedges, MAC "Lady Danger" Lipstick, Charlotte Russe necklace (similar), Arm Candy ℅ Fashion Loopy, Sunglasses ℅ Rolling Threads. Pictures by my sista Mely Tapia. Gorgeous dress and the red lipstick is so perfect with this outfit! Now that's a perfect way to spend the weekend! Beautiful historical place. 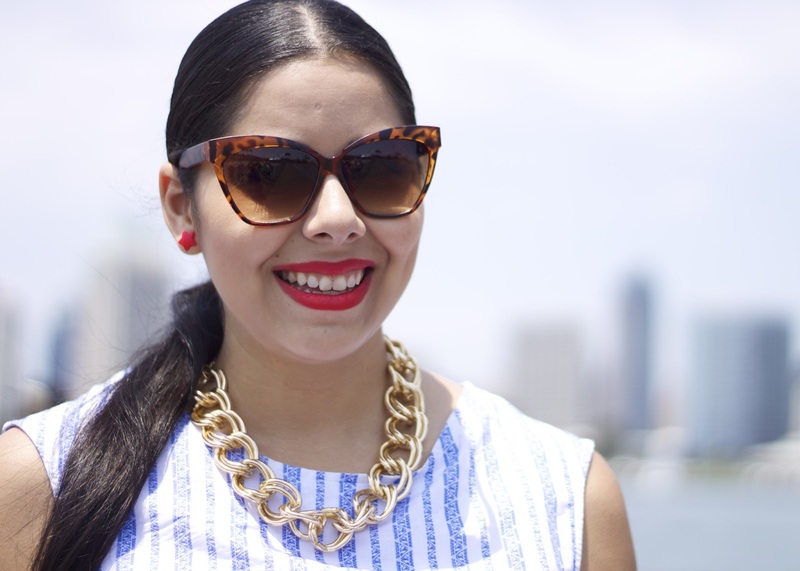 Loving how you incorporated red, white, and blue to your wardrobe! Very Chic amiga. I love the combo! 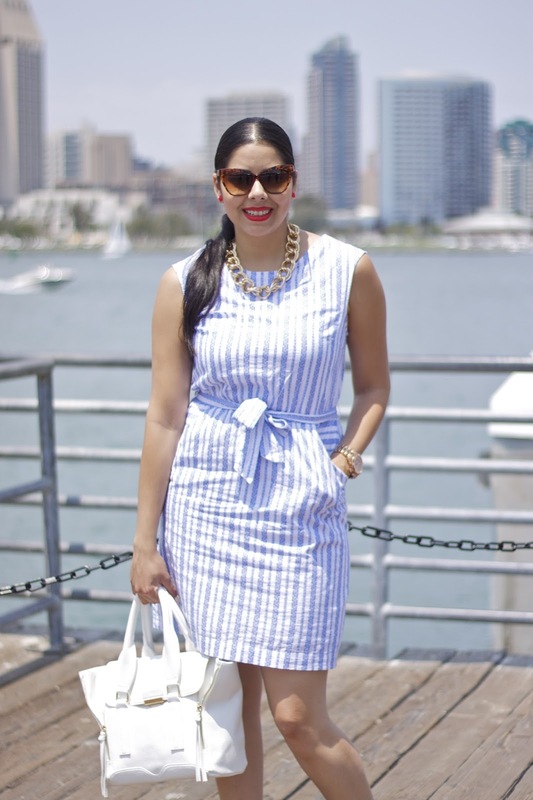 It is so perfect for the 4th yet it doesn't scream it which makes it totally perfect for the rest of the year, is sophisticated and chic, right up my alley. Red lipstick is perfection on you Pau. I love the outfit Paulina! :-) I love how subtle the red, white, and blue are. Looks like you had a great day with your family. Great pics! Your dress is so pretty! 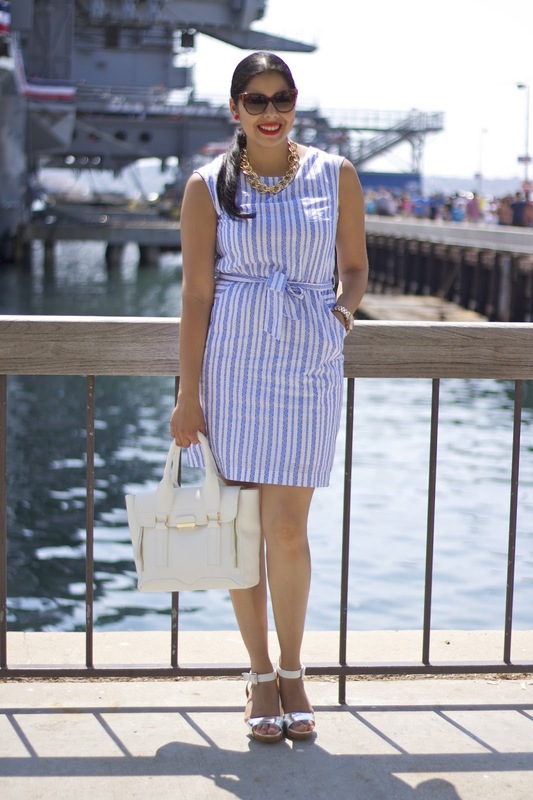 Perfect 4th of July dress! And I love the bag! Love the look, the red lip looks good on you! This look is head to toe perfect! Love the bold lip!